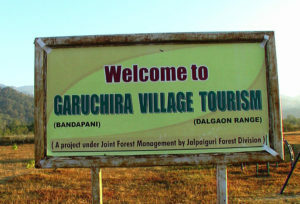 Garuchira village eco tourism is a brilliant initiative of the government to assist development in the hilly region of north Bengal. 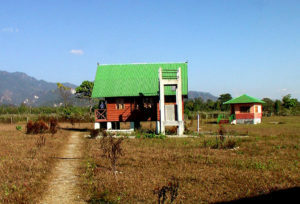 The government bungalow as part of the tourism is located in Bandapani Bil, Dalgaon Range of Jalpaiguri Forest Division. 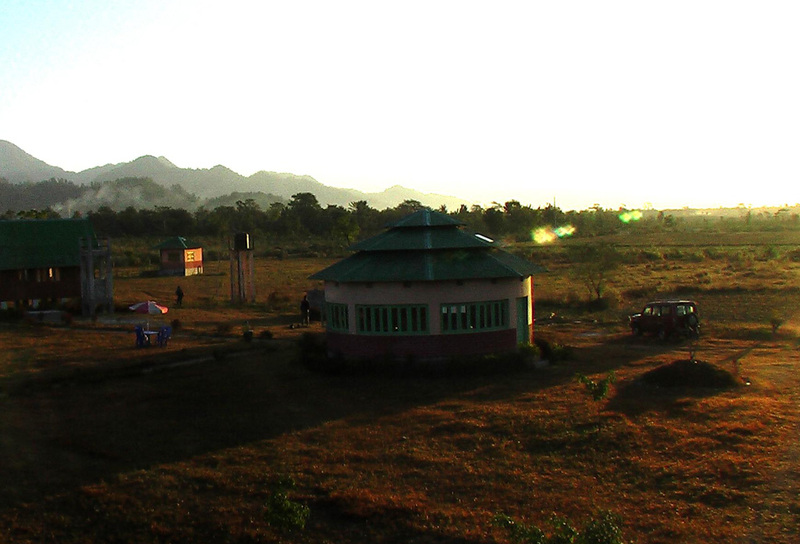 Garuchira is located at a distance of 80 kilometers from Jalpaiguri and is a beautiful place surrounded by rivers. The eco tourism spot is a lovely one with elephants making rounds of the place. Its position in the foothills of Bhutan gives it a special place in the heart of the tourists. The peaceful ambiance and the vast greenery attract tourists to this heavenly place. Garuchira is around 80 kilometers from Alipurduar and you can reach the place by hiring a car from either Jalpaiguri or Alipurduar. Get down at the New Jalpaiguri railway station and take a taxi/car to Garuchira via Birpara. 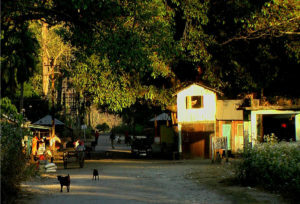 Dalgaon is another station where you can disembark from the train to arrive at Garuchira. The eco spot at Garuchira has 3 cottages which have basic amenities for the guests. The cottages can accommodate 3 people at a time. Food is provided at the cottages. Plans for 2 more cottages and 5 tents are on the pipeline. Garuchira eco spot lies between the holy Supti and Reti Rivers making the land fertile and adding to the charm of the region. Fresh air, lot of greenery and peaceful atmosphere works wonders on the mind and soul of the visitors. The forest is full of Saal and Teak trees which you can explore with the guide. There is a watchtower at the eco spot from where you can frequently spot elephants. Garuchira serves as the gateway to the elephants from the neighboring land of Nepal. During the rainy season the rivers overflow and it looks extremely beautiful. There is also a children’s park at Garuchira eco spot and also a man-made tank full of fish. You will find various species of colorful fish swimming inside the tank and holding your attention. For the adventure loving souls you can follow the trekking trail around 10 kilometers from the forest and reach Bhutan Hills. There is a monastery and a cement factory at Gomtu in Bhutan which is only 5 kilometers from Garuchira. Also visit the kali Temple in Makrapara close to Gomtu. Experience sheer bliss in these lands among the local village people and the wildlife free from your worries. This entry was posted by indispottravel in Bird Sanctuary in West Bengal, Dooars in West Bengal, Forest Bungalow in West Bengal, Jungle Safari in West Bengal, West Bengal and tagged 10 km trekking to Bhutan Hills from Garuchira Village, accommodation at Garuchira Village, animals of Garuchira eco spot, car to Garuchira via Birpara from New Jalpaiguri, cement factory at Gomtu, children’s park at Garuchira eco spot, cottages at Garuchira Village, cottages availability at Garuchira Village, distance of Garuchira Village from Alipurduar, distance of Garuchira Village from Jalpaiguri, dooars, dooars in west bengal, doors north bengal, dours tour, fooding and lodging at Garuchira Village, Forest, Garuchira eco spot, Garuchira eco spot lies between the holy Supti and Reti Rivers, Garuchira eco spot location, Garuchira eco spot watchtower, Garuchira location, Garuchira village ambiance, Garuchira village description, Garuchira Village Eco Tourism, Garuchira Village Eco Tourism atmosphere, Garuchira Village Eco Tourism attaractions, Garuchira Village location, Garuchira village position, government bungalow Bandapani Bil, hiring a car from Alipurduar, hiring a car from new Jalpaiguri, hotels at Garuchira Village, how to go to Garuchira Village, how to reach Garuchira Village Eco Tourism, jungle, kali Temple in Makrapara close to Gomtu, monastery at Garuchira eco spot, monastery Gomtu, night stay at Garuchira Village, north Bengal, reaching Garuchira Village, resorts at Garuchira Village, Reti River, room availability at Garuchira Village, staying options at Garuchira Village, Supti river, tent availability at Garuchira Village, tents at Garuchira Village, Village Tourism, Village Tourism of north Bengal, where to stay at Garuchira Village.